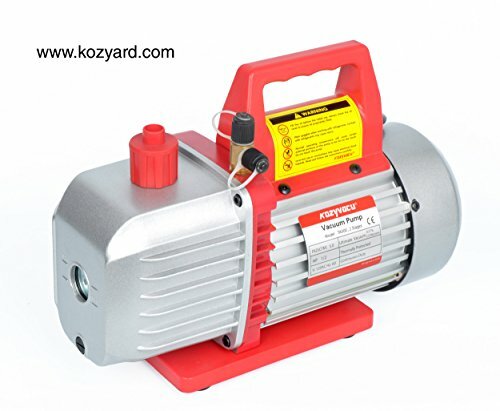 Kozyvacu 5CFM 2-Stage Rotary Vane Vacuum Pump (5.0CFM, 40Micron, 1/2HP) for HVAC/Auto AC Refrigerant Recharging, Degassing wine or epoxy, Milking cow or lamb, Medical, Food processing etc. The Kozyvacu® TA500 has been performance and relibility tested to meet Kozyvacu's high standards. Its power and capacity meets for a wide range of service applications, it delivers a high CFM rating for fast thorough evacuation. High torque design for easy startup and efficient operation; and a Die-Cast Aluminum Housing - Cast aluminum housings make the pumps lightweight while durable. it is easy to start and maintenance free. Oil Fill Port - Makes adding oil simple since the port is accessible from the front or either side. Foam molded packing for safe transportion. 1 x 380ml White Oil Bottle Filled With Oil. While a AC system requires 500micron ultimate vacuum, Kozyvacu TA500 delivers better than 40micron to make sure that you can reach the vacuum meet your requirement.